These treatments are not planned in advance, as it is commonly done in External Beam Radiation Therapy, due to the uncertainties of the surgical procedure in which IOERT component is included. Engineers, radiation oncologists and surgeons from Universidad Carlos III de Madrid and Hospital General Universitario Gregorio Marañón have been working on improving these procedures through different developments. 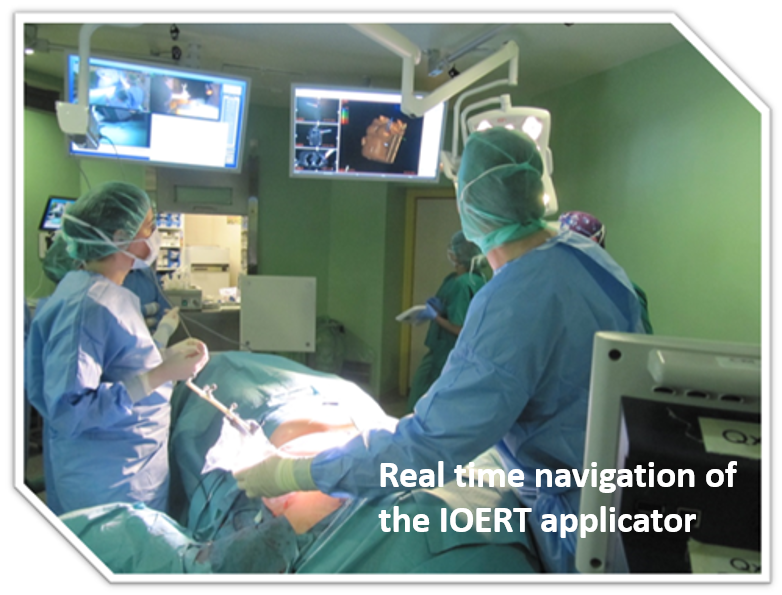 BIIG collaborates with a commercial company (GMV) that has developed a treatment planning and simulation system for IOERT. 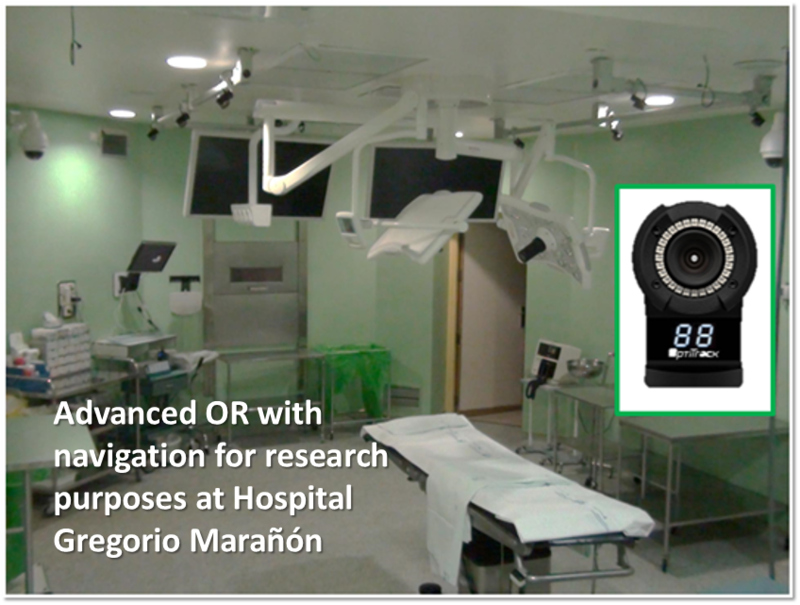 Navigation using patient CT images and a multi-camera optical tracking system. Facilitation of the docking procedure for mobile LINACs. Integration of surface scanning in the treatment for improved dose estimation. Analysis of intraoperative imaging devices for IOERT dose estimation. García-Vázquez V., Marinetto E., Guerra P., Valdivieso M.F., Calvo F.A., Alvarado-Vásquez E., Sole C.V., Vosburgh K.G., Desco M., Pascau J. Assessment of intraoperative 3D imaging alternatives for IOERT dose estimation. Z Med Phys. 2016 Aug 23. pii: S0939-3889(16)30057-5. Guerra, P., Udías, J.M., Herranz, E., Santos-Miranda, J.A., Herraiz, J.L., Valdivieso, M.F., Rodríguez, R., Calama, J.A:, Pascau, J., Calvo, F.A., Illana, C., Ledesma-Carbayo, M.J., Santos, A. Feasibility assessment of the interactive use of a Monte Carlo algorithm in treatment planning for intraoperative electron radiation therapy. Phys Med Biol. 2014 Dec 7;59(23):7159-79. Calvo, F.A., Marinetto, E., García-Vázquez, V., Santos-Miranda, J.A., Solé, C., Desco, M., Pascau, J. Stereotactic image-guided intraoperative electron irradiation: proof of concept and clinical feasibility. ESTRO 2014. 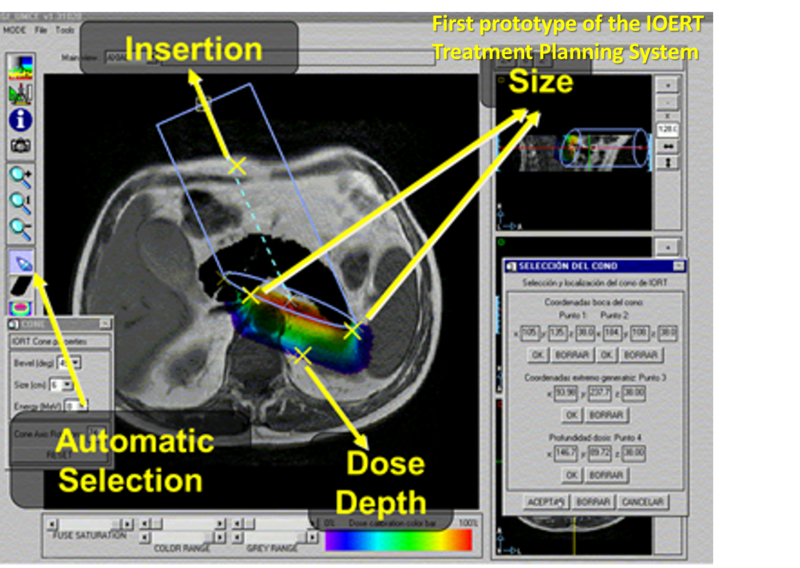 Intraoperative radiation therapy adapted optimization in a technological operating room: navigation, imaging, miniaturization and dose estimation for clinical safety and quality control. PI15/02121. Instituto de Salud Carlos III. Ministerio de Economía y Competitividad. Technological developments for more precise and safe intraoperative treatments. XIORT. IPT-2012-0401-300000. Subprograma INNPACTO. Ministerio de Economía y Competitividad. Multimodal medical imaging in real time for complex treatment scenarios. TEC2010-21619-C04-01. Ministerio de Ciencia e Innovación. 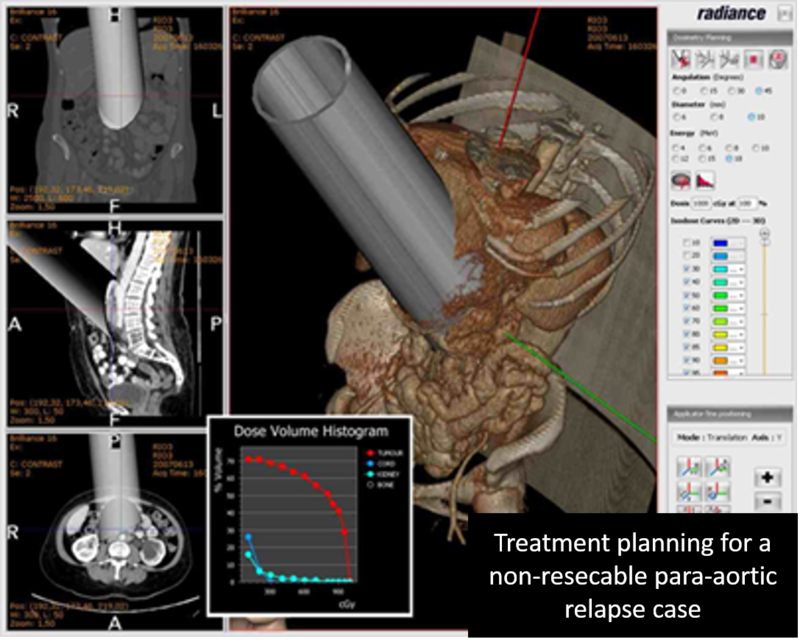 Image-guided simulation and treatment in radiation therapy (PRECISION). IPT-300000-2010-003. Subprograma INNPACTO. Ministerio de Ciencia e Innovación. Multi-hospital simulation and training system evaluation in the optimization of clinical practice in intraoperative radiation. PI09/90568. Ministerio de Ciencia e Innovación. Research on image-guided treatment and simulation technologies for a safer clinical practice (ENTEPRASE). PSE-300000-2009-5. Ministerio de Ciencia e Innovación. Evaluation of the clinical viability and usefulness of a tool for planning and simulation in intraoperative radiation. PI08/90473. Ministerio de Ciencia e Innovación. This technology is protected by patent PCT/ES/2008/000240.